Vernons is a name in the gaming industry that is epic. Reigning since 1925, they have come a long since the days of launching football pools. It takes the know-how, determination and first class service to achieve the integrity that still holds true today. Times they are indeed changing and Vernons Bingo is no exception to the rule. Taking on a new acquisition in May 2012 Littlewoods Bingo was taken over as Vernons Bingo and stayed within all the parameters of the former site. Another major change came when a switch to a new platform in October 2012 completely transformed the site. Out went St Minver software with the arrival of Virtue Fusion a bingo division of the renowned Playtech Entertainment group. The move has been greatly received by players with large variety of games and promotional offers. Vernons is licensed and regulated by Alderney and United Kingdom. Amazing Jackpots are what you will find with many opportunities to win big. Cash prizes are enormous with games like Deal or No, Star Jackpot, G-Luxe Jackpot, Fixed Joker Jackpot, Giant Jackpot and more. Play the most popular bingo variations including 90 ball and 75 ball bingo. The Slots will win you over and with a bit of luck you will the final winner with popular favorites that only The X Factor, Britain’s Got Talent, Mafia Millions and Clover Countdown can deliver. Fun Arcade Games add an element of unique entertainment. Wheel of Light is a twist on classic Roulette, Crystal Balls is the game to find your future while Risk It Progressive challenges as each card is drawn. If you are itching to play something different try Cops N Robbers, Winning Match, Wintery Wonderland and Golden Balls Quick Scratch Cards. The winning is easy in this simple yet tantalizing match games. Players will feel the hospitality as they are warmly welcomed with a Deposit Bonus to kick start their bankroll including a Second Deposit Bonus. Monthly Offers have amazing Jackpots and values with exciting games. The £100K Big Night Jackpot takes place on the last Friday of every month in the Bingo Café room huge Guaranteed Cash prize up for grabs. 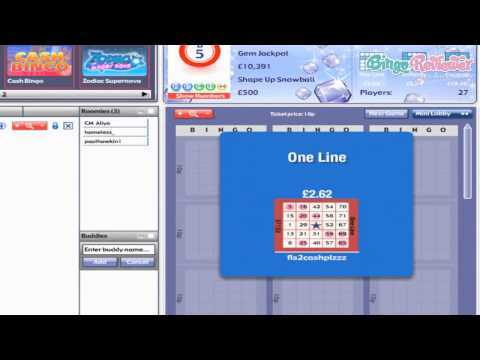 Chat Games keep the bingo rooms lively with fun interactive games and Bingo Bonuses awarded to the winners. Vernons Bingo has the integrity and longevity players can trust. The promotional offers have mega Jackpots and there is always plenty of action in the bingo rooms. We rate Vernons Bingo with 4 Pink Hearts. I played at this site when it was Littlewoods Bingo and now that is Vernon's Bingo i have to say i was a bit skeptical at first to play there. But after reading about the history of Vernons they have the background that is trustworthy. The games are all the same and not a lot has changed which is a good thing. I like Monopoly Slot and had some luck on it. I do think that the £1 free no deposit bonus is not very generous but compared to some sites that offer nothing it is ok but still bah humbug! Vernon's now has a much more pleasant signup bonus - spend £10, get £30. So once you join and make your initial deposit you will have £40 to spend on your favorite games at Vernon's. With their free daily scratchcard you can play every day for a chance to win £500. This in itself is a good reason to login every day. Who wants to pass up £500? Vernons Bingo Linx £10,000 daily super prize - just to line your pocket! For something special every day at Vernon's, try the Bingo Linx games. Bingo Linx games take place every day in the Bingo Café and pay out £10,000. You can buy your tickets for only 50p. Check the schedule for all play times. A visit to the rewards page will show you the way to riches to be won at Vernon's Bingo. Get a sample of the VIP lifestyle with Vernon's VIP Club Rewards. Each purchase of cards at Vernon's gives you the reward of Loyalty Points which you can use to boost your balance and play more bingo. They also have a great chat game program where you can make friends, chat away your bingo day and earn extra bbs so you can play even longer. Have fun at Vernon's Bingo- it looks like a wonderful place to spend your bingo time. This is one of those "as seen on TV" sites. They should definitely do something about the site design: it's really not easy on the eyes with the bright colors and graphics. They have a nice promotions going for the new players, and that includes the 300% bonus on your first £10 deposit (you do have to make wagers for £10 too). After your second deposit, you get a month of free bingo (The Penthouse Bingo Room, every Tuesday night between 8pm and 10pm), which is really a great offer, specially because there are real cash prizes. There are 12 rooms in total in Vernon's bingo, and 75 and 90 ball games, with tickets starting from 50p, so it is unlikely that you will get bored, even if you like to play something other than the classic bingo. If that's not enough, there's a long list of other games also available, like slots, scratch cards and some other instant games. 18+, opt-in required. New customers only. Min first deposit £5. £5 must be spent on bingo tickets to receive £25 bonus funds. 4x wagering requirements for bonus. 14 day expiry on bonus. Contribution to wagering requirements varies by game. Further eligibility and terms apply.